As they grow up nearly all kids start to get into music of some kind or another. 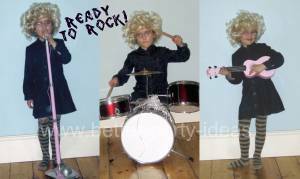 If you have a budding Rock Star in your family a Rock Party is pretty easy to do and lots of fun. This can be any guitar based design or pictures of rockers in action. A cute option is to take a picture of the party boy or girl dressed up and strutting their Rock Stuff! and use it as a base for your design. You could even merge a few pictures to make a whole band like in the picture above. Cut-out guitars stuck on the walls. Silver and black balloons and streamers. Any rock posters you can beg or borrow. It might be worth asking in your local record store for old promotional material. If possible close the curtains and have some flashing lights. You can of course use Christmas Lights etc. Anything goes as long as it rocks! Young girls enjoy dressing up with a bit of over the top make-up. Gloves, belts and leggings with skirts seem to be where it is at. While young boys love wearing cool shades, T shirts, leather jackets and spiky hair gel. This makes a great addition to a rock star party. Either tell your guests to design a CD cover at home and bring it along for judging. Or provide card and pens and crayons on the day. Put all the designs on a table for judging pehaps by those old rockers Gran and Grandad, or you could have little scorecards for everyone to vote for their favourite. Later hold up all the designs one by one and give each artist a clap. You may then like to slip the CD cover around a little CD rock mix selection (that you have put together and burned) either in a jewel case or plastic CD wallet. Then everyone can take their design home looking like a real CD. This is similar to above but you have previously prepared a cardboard guitar for each guest. It makes a good activity while guests are arriving. Cut a template to draw around ( if you can get hold of one a Ukelele is a perfect size template) and mark out and cut your guitars. The card from strong cardboard boxes is just the right thickness. Paint the guitars white or silver as a good base colour. Have these blank guitars ready as your guests arrive. Provide pens, stickers and other craft bits and pieces for the young Rock Gods and Goddesses to adorn their guitars. You can award a prize for best design. Have an air guitar competition or just dances holding / using the guitars. And, at the end of the party, everyone can take their guitar home. This is a great way to get a rock star party going. Really it is just a version of musical bumps. The children dance around but when the music stops they have to drop to their knees in classic rock star guitar pose. If there is any doubt get Dad to demonstrate! In theory you could have the last judged to drop down being out but sometimes its just as much fun to keep everyone in and just play the game for laughs. This leads on nicely from the game above and is a great icebreaker. Its a bit like musical statues. It is really really popular with kids, do try to include it. The children dance around as normal. When the music stops they have to strike a pose of your choosing and freeze. This is made more fun by the fact that many of the tangles involve working with others. You need to call out clear instructions (and possibly demonstrate) each time the music stops. In 2's - facing in opposite directions, touching your toes, backsides together. These are only some example its easy to come up with plenty of your own depending on the age of your kids. All the wannabe popstars sit around in a circle on chairs. One child stands in the middle with their finger on the top of a cane with a toy microphone sticky-taped to the top holding it pressed upright to the floor. They then shout the name of another child let go of the mic and jump out of the way. The named child must jump up and catch the mic before it hits the floor. If they succeed they take over in the middle. If not the original dropper wins a sweet and repeats the process but names a different child. The kids compete to see who can win most sweets. Tips: To avoid children just picking their friends you could give each child a secret stage name. The kid in the middle must select a name from the list. Be prepared to adjust the size of your circle until you find the best chance of just catching the mic. This game takes a bit of preparation but is a popular addition to the fun. Before the party you have to find and download pictures of 4 different pop stars. This is just a guide however and your child may have particular favourites. The pictures should be A4 size. If possible download and print onto thin card (or laminate paper copies). The children will be divided up into teams of 4-5 and you will need a copy of all 4 pictures for each team plus one spare of each picture as a guide. Tip: A good rule of thumb is the same number of pieces as age of the birthday child. To clarify each team needs 1 of each of the 4 pictures cut into pieces, each piece marked on the back with that teams colour. All the pieces from all the pictures are then mixed together. The children are split into teams and each team given a colour. The mixed up pieces are spread all over the floor. When the music starts the children have to dash around finding pieces marked with their teams colour. They must leave behind any pieces belonging to other teams. Gradually as they get enough pieces they can begin to piece together the pictures. You may like to allow an adult helper with each team. There are two different ways of doing this game. 1. The kids dance around and every so often you call out someone's name. Everyone then has to copy that person whatever move they make. 2. Pair the children off. They then dance facing each other with one copying / mirror imaging the other. Every so often you shout change to swap the lead role to the other partner. 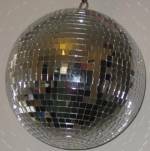 There are certain dances that lend themselves to party fun. Check out videos on the internet if you are not sure of the actions / dances. Older kids may consider these dances more pop than rock but younger ones will not notice or mind. This is always a hit at any rock party (or any type of dance party). Build a Rock~O~Meter. The one in the picture is made out of wood but you can easily make a version out of card. Large sheets are available from good stationers or you could paint cardboard. The moving pointer is simply on a small dowel rod. This is turned from behind. You can have all sorts of fun with a Rock~O~Meter. It can be combined into many other ideas. Use it to "fun judge"
Either have someone working the dial based on what they think or use it as a way of registering applause or cheers. Don't forget to include an adult's rock contest. Kids will love to use the Rock~O~Meter to judge Mum's, Dad's or Grandad's dance moves!